Get Rid Of Eye Bags Naturally With These amazing tips and tricks. 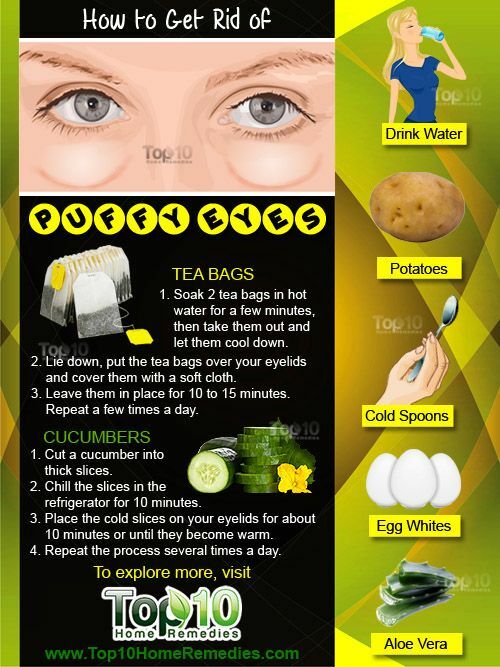 Send your eye bags packing with these natural remedies that will greatly enhance your appearance. Be sure to watch the face yoga video tutorial too. If you’re tired of waking up with those big, puffy bags under your eyes, then this post is just for you. We’ve rounded up some excellent home remedies that will send your eye bags packing. From cucumbers to potatoes and even cold spoons, there are plenty of great ideas to try. You’ll also love the Face Yoga that specifically targets this embarrassing issue. This helpful infographic from DR. Axe shows why you get bags under your eyes, and how you can treat them. There are a lot of remedies including oils, dietary collagen as well as suggestions on what to avoid. You’ll notice it also includes a ‘facial exercises’ recommendation, which Face Yoga fits perfectly. Dr. Axe also recommends treating underlying conditions that could be causing those puffy eyes. These may include allergies, eczema, water retention, and even your sleeping position. Lifestyle choices such as smoking and drinking can also impact you. Although hereditary genes may play a part in baggy eyes, they can be treated and prevented with natural methods and undereye creams. Top10HomeRemedies has more great ideas that are all-natural and beneficial. The great thing about using natural remedies at home is that you won’t be putting any chemicals on your skin which is your largest organ. Tea bags work extremely well as does coffee. Both act as natural stimulants and can wake up the affected area and reduce puffiness quickly. In the video above, you’ll see a fantastic pose from Face Yoga creator Fumika Takatsu. It promotes circulation around the eyes, which can instantly help depuff bags. If you loved the feeling the exercise in the video gave you, then you’re going to love trying out more Face Yoga Method poses too. It’s the ultimate non-surgical facelift. There is also a lot more you can try out on the Face Yoga Method website, as well as some free e-books you can download here. Want more? See how you can debloat your face here.